Phoebe Philo has this remarkable ability to transform a relatively unassuming (and unfortunately forgettable at times) house into something practical and relevant and more importantly, utterly covetable. 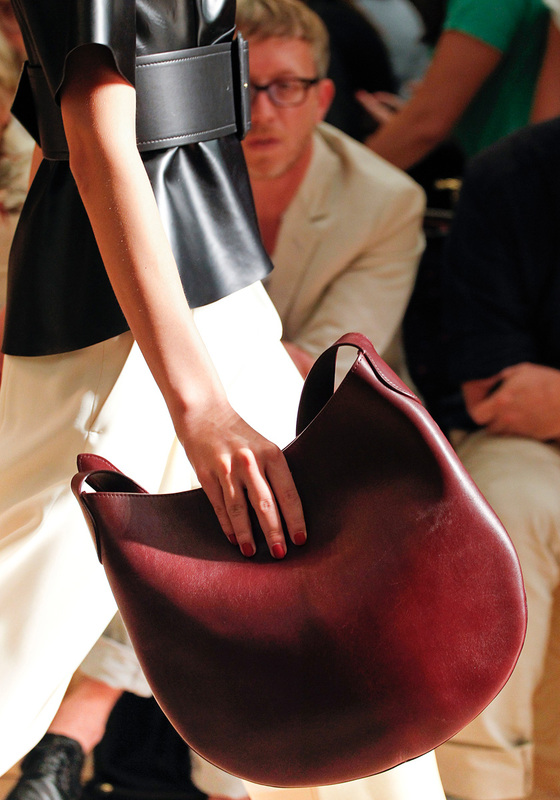 There an undeniably chic quality to Céline this season. Her study of “strength, proportion, and a woman’s form” is wonderfully executed with sophisticated aplomb. But what I truly love about Philo’s vision for Céline is how organic it feels. The lack of influence or inspiration to it makes it all the more refreshing after a long series of shows (they all start to blend together after a while). With a clean palette, Philo is able to give us a collection that showcases a practical sort of sophistication supported by a particularly brilliant technique. And her technique is exquisite. 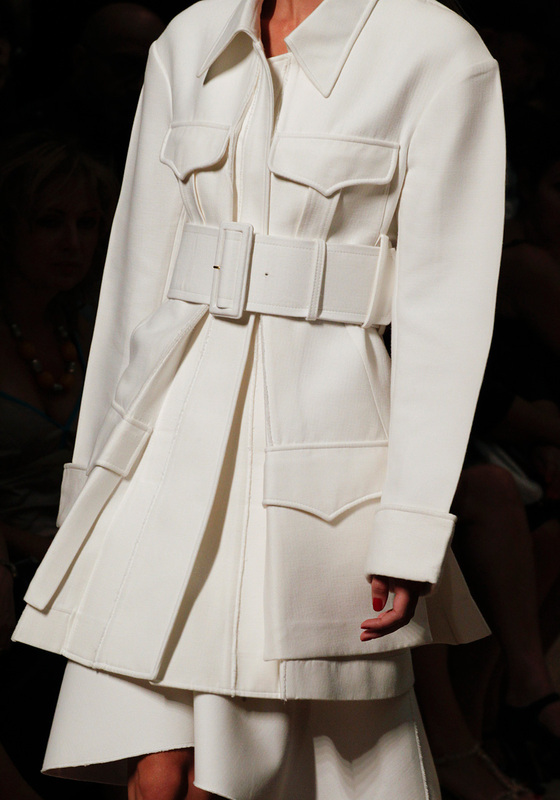 If nothing else, Phoebe Philo’s concept of line and structure is superb. Her Spring 2012 has all the ease of a Sunday morning, providing a great sense of luxury and leisure. Heavier fabrics are reworked into effortlessly polished looks perfectly suited for spring; tailored leather pieces–a specialty of hers–turn unbelievably supple and convey chic elegance. I love the asymmetry that she introduces, leaving a fluttery trail of fabric in the model’s wake. Something about a fluttering train totally signals spring to me; it must be the airiness of the movement. And she offers a fantastic version of the peplum to boot; the “abstracted peplums” (Mower) or “basques” as she calls them are fabulously weighty. There is some serious volume to them. Certainly nothing like the flirty feminine peplums some have shown this season. I find the abstract, slightly futuristic take all the more enchanting for Philo’s lack of romantic flight of fancy. Abstract peplums aren’t the only thing to love about Céline this season. I am sort of in love with the silhouette of the first couple of looks. 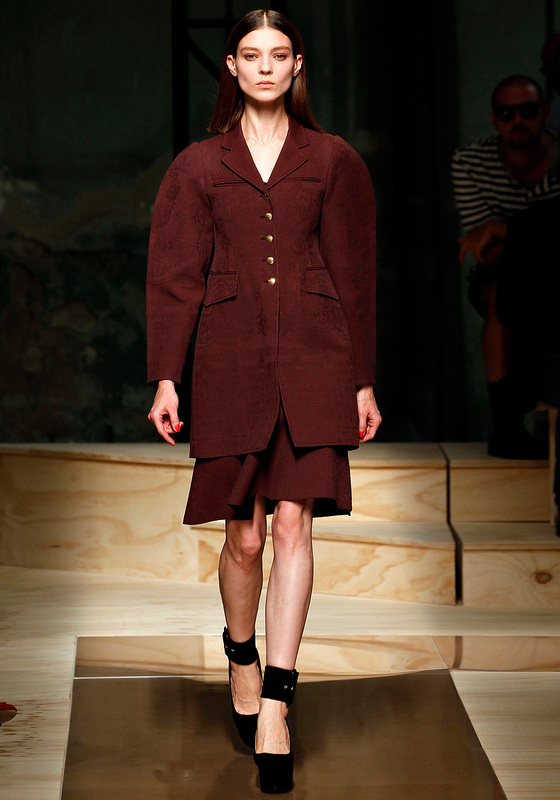 Trust Phoebe Philo to make me delight in the idea of a sturdy, structured coat for spring. There is something indulgently avant garde about the sloped silhouette with its exaggerated rounded shoulders and curved sleeves, trellised flourishes subtly embossed onto rich cream or deep Merlot. And I love the bit of weight to the structured coats, giving it much more presence than the tissue-thin light concoctions usually seen in the spring shows. Moreover, solid suede platforms grounding the entire collection without overwhelming the look; they add just the right amount of strength and balance to sheathed excesses of fabric. 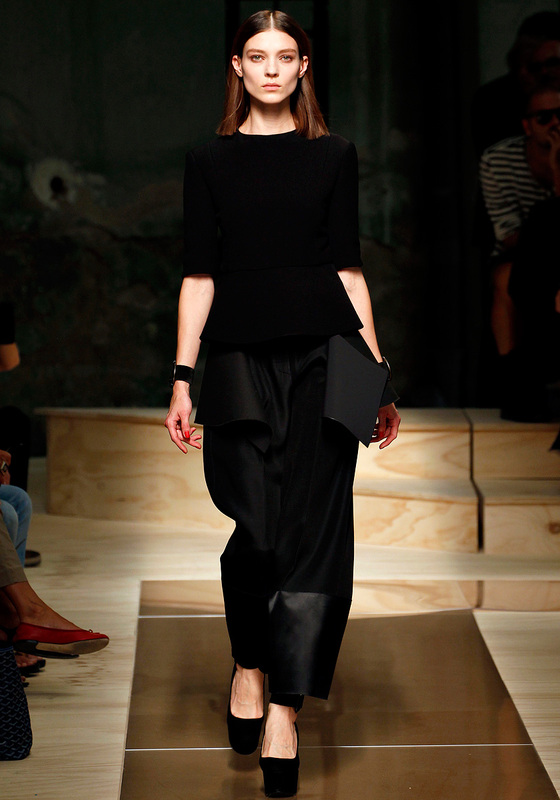 Another exquisitely proportioned for collection for the ever-chic Phoebe Philo.